The Evans family, from left, dad Donnie, daughter Arabella, cancer survivor, Anderson, and mom, Criston. 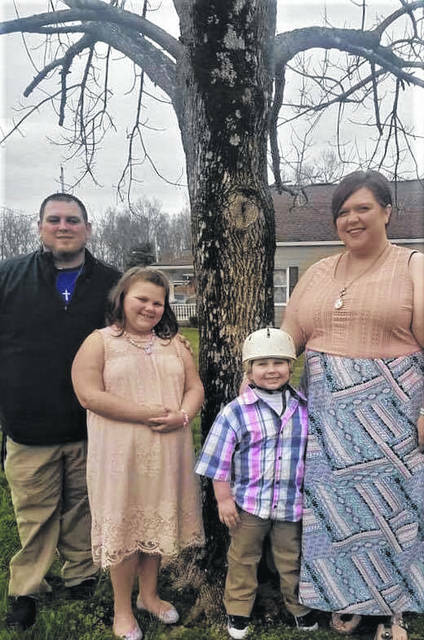 “At first, I think we were just kind of numb, trying to process it,” said Donnie Evans about the reaction of he and wife, Criston, upon first learning son Anderson, then age two-and-a-half, had a baseball-sized tumor just inside his skull. Flash forward a little over three years. Although he is not completely out of the woods, Anderson has been declared cancer free. That doesn’t mean the journey taken by him and his family has been anything like an easy one. Along the way, doctors referred the Evans family to the well-known Make-A-Wish Foundation, usually associated with granting the wishes of terminal children. Donnie explained the organization often works with extremely ill children as well. Anderson’s parents describe their son as extremely outgoing despite his health problems. “Our son loves everybody and everything,” Criston said. Both mom and dad say their son loves the outdoors. Put all that together and Anderson’s wish kind of makes perfect sense. When the Evans bought their Sciotoville home, they had every reason to believe there was a perfectly good swimming pool in the backyard. The pool was covered, and the couple never really questioned its condition. They later found out it wasn’t in such good shape, with, for example, duct tape holding together the pool liner. Anderson’s wish is to have the pool fixed and upgraded with a slide, creating a fun place for him and his friends to hang out. As it turns out, Make-A-Wish wasn’t sure they could do a pool. The slide especially proved to be a hurdle. Enter Portsmouth’s Radiant Pools and Spas. “Anderson’s wish was to ‘have our in-ground pool repaired, a slide and a place for his friends to sit and hang out’, his words exactly,” said Alison Logan, operations manager for Radiant Pools. Logan said Make-A-Wish has installed pools for children before but never done repairs. The Evans talked about the slide creating insurance problems for the foundation. “After many bumps in the road and getting the go ahead just to be halted the next day, we finally got everything pushed through,” Logan said. Make-A-Wish is supplying part of Anderson’s wish, while Radiant is doing a lot more somewhat behind the scenes, including finding and supplying the all-important slide and some patio furniture, the latter to truly make the pool a place to hang out. Returning to Anderson’s story, doctors decided he had developed Ewings sarcoma, described as a very rare form of cancer mostly striking children and teens but at a rate of less than 1,000 cases per year. According to Donnie, Anderson’s initial prognosis was not good. And the situation quickly went from horrible to something worse. Anderson’s diagnosis was confirmed on a Thursday. At 3 a.m. the next day, Donnie said Anderson flat lined. His heart stopped and he wasn’t breathing. Naturally, his parents rushed him to the emergency room. The young boy eventually underwent eight hours of surgery. His parents were told it might be days before he woke up. Instead, Anderson was up and alert about an hour after surgery. “From the first, he’s always been a fighter,” Criston said. After spending about a week in the hospital, Anderson immediately was started on chemo. The process was not an easy one. Anderson would spend a week in the hospital every other week and his treatment lasted 11 months. In August 2015, the family, which includes daughter Arabella, now 8, had to travel to a children’s hospital in Philadelphia where a world-class specialist in Ewings was available. This round of treatment lasted five days a week for six weeks. The good news is it seems to have Anderson headed in the right direction. In July 2016, Anderson was declared cancer free, though he will have to be tested continually for some time and his medical problems were not over quite yet. During his many treatments and surgeries, Anderson had part of his skull removed. In May 2017, he went into the hospital to have a permanent implant put in place. The surgery was declared a success, but just a few months later, the implant became infected. Anderson had to go back into the hospital to have it removed. Doctors couldn’t immediately replace it. A flap of skin was the only thing separating Anderson’s brain and the outside world. As a result, except when he was sleeping, for nine months, Anderson had to constantly wear a helmet. The helmet is no more as in April, Anderson went back into the hospital to once more have a permanent implant placed in his head. This time there have been no complications, at least so far, Donnie said. While Anderson is doing well , his father stated Ewings has a high rate of recurrence. Doctors routinely scan his head and lungs and the testing is unavailable locally. As they talk about Anderson’s health issues, his parents repeatedly refer to their faith and their belief God helped them and their son. They also talked about how Anderson’s cancer affected the whole family, how his maternal grandmother quit her job to be able to help more often. But the Evans said the whole situation was especially rough on daughter Arabella. Logan said the hope is have an unveiling of Anderson’s wish this Saturday. His parents have tried to keep it a secret from their son, though they admitted that was getting harder and harder considering some of the work being done in their backyard. Radiant Pools is accepting donations to offset the cost of granting Anderson’s wish. Donations can be mailed to or dropped off at their Portsmouth location, 2156 Scioto Trail. https://www.portsmouth-dailytimes.com/wp-content/uploads/sites/28/2018/08/web1_make-a-wish-photo-2.jpegThe Evans family, from left, dad Donnie, daughter Arabella, cancer survivor, Anderson, and mom, Criston.